The other day I was eating lunch and watching one of the original Star Trek episodes: "The Man Trap." 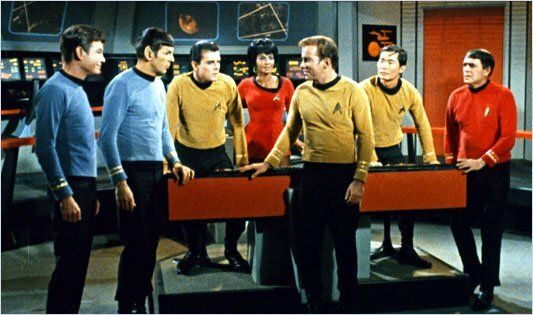 In a rather incidental scene, Lt. Uhura, the communications officer, tells Captain Kirk that she has a message from Captain Dominguez, from another starship. She informs Kirk that Dominguez is complaining that he awaits the delivery of some urgent supplies that Enterprise is carrying. Kirk responds, smiling wryly: "Tell José he'll get his chili-peppers when we get there. Tell him they are prime Mexican Reds -- I picked them myself." Once again, I found myself high-stepping through the bog of political correctness. My uh-oh alarm went off. I found myself thinking: "Boy, they would never get away with that line today." Then, I thought, why the heck not? "soul food," a good steak, sushi and bannocks. Everyone knows the original Star Trek series had an agenda, especially when it came to depicting a future with racial equality. The show even boasts the first interracial kiss ever on television. But, at some point, though, between then and now, belief in racial equality turned into the pretense that there are no cultural differences. At some point, the mere mention of cultural things connected to race became a form of bigotry. So, here was a scene that was clearly engineered to show the Star Trek audience that, in the future, Mexicans (and African Americans, for that matter, in Uhura's case) will (quite opposite to the white-centric situation in 1966, when the Enterprise launched onto the small screen) be universally accepted leaders -- that "someday" no one will bat an eye if a captain is named "Dominguez." But, to the ever more un-elightened enlightened viewers of the future (us) this scene can be seen as a case of racial stereotype. Sad. When I was a kid and people started talking about the "Great American Melting Pot" -- a country with many races blending into one -- minority groups began (quite rightly, I think) to protest: a melting pot would mean a loss of cultural identity. Those protesters seem not to have made a dent. Now, though we don't say it out loud, we depict a harmonious cultural world as one that pretends that there simply are no cultural differences. I say let Captain José have his chili-peppers; let Kirk have his haggis; let me have my pasta. And let's not look the other way as if something dirty is going on when each enjoys the food of his own culture. On a similar vein, I was accused of being offensive for suggesting a traditional Japanese kimono as a halloween costume for my niece... Sigh. Crazy, HC. Sounds to me like a costume that dignifies the beauty of Japanese tradition and culture. exactly the kind of thing I'm talking about. Grr. But for the newer Treks, racial balance is so old hat. It's all about different species now - shape shifters, blue skins, antennaed hermaphrodites. Even Captain Pike had a little fling with a green-skinned woman. Egocentric Sharing: Facebook and "Me"
Kites, Cardigans and Good Ol' F.U.